We lost my wife’s grandfather earlier this year, in addition to my mom, which leaves some pretty big holes and has us ready to kiss 2013 goodbye. One silver lining, though, is that I had these remarkable people in my life, and they’ve inspired some satisfying modeling projects. Grandpa Ray was salt-of-the-earth. He was the third generation to live on the family farm, but he supported his ten (yes TEN) children driving a truck. The farming he did gentleman style – a huge garden, some fruit trees, and for several years he even grew our family’s Christmas trees. It wasn’t his job, it was his way of life. He tended that land on Highway 310 for eighty-nine years. 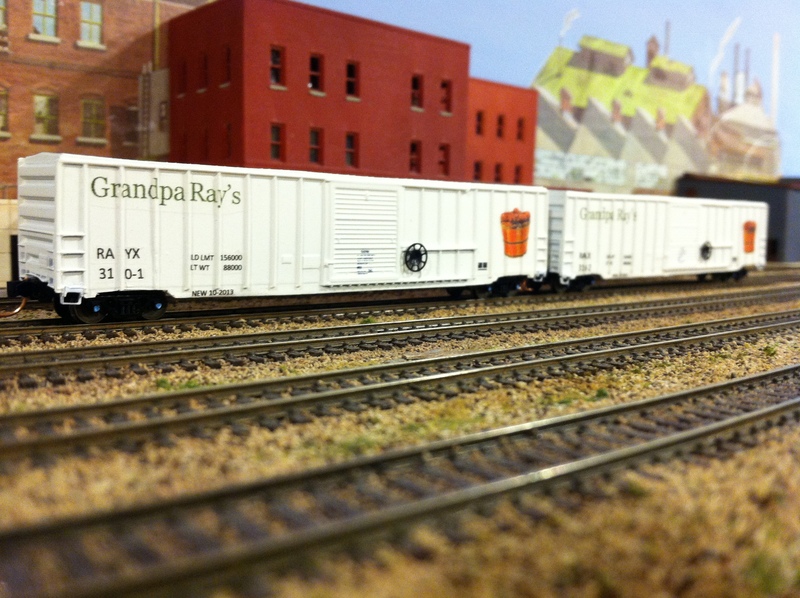 This winter I will add a switching district to the layout, and one of the core industries will be Grandpa Ray’s Produce. These large boxcars will haul produce and canned goods from Grandpa Ray’s facilities to markets across the nation. The fictional company borrows a lot from JR Simplot Company, an Idaho-based foodservice giant. The late Mr. Simplot, from what I can gather, would have been a kindred spirit to Grandpa Ray. He was a no-nonsense farmboy who valued hard work and, like Ray, refused to let age slow him down. 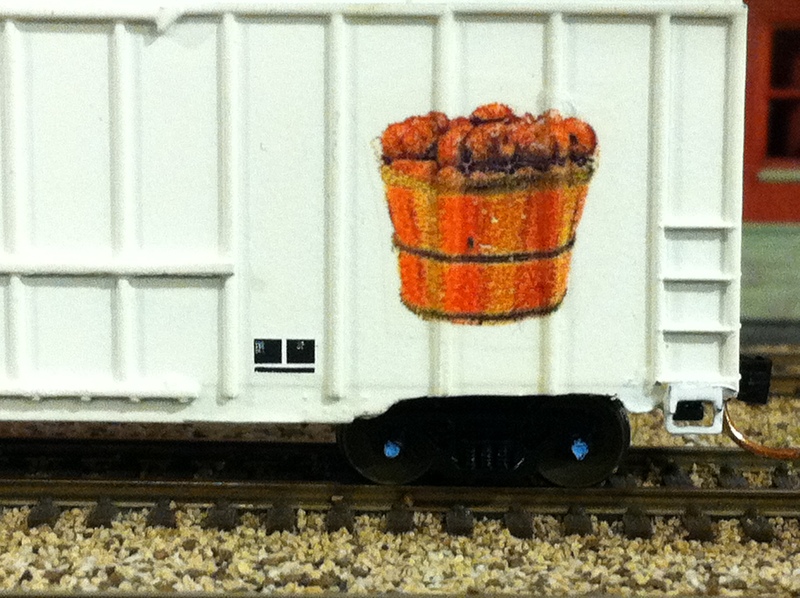 I have always been drawn to the Simplot insulated boxcars. These are mammoth pieces of equipment with the name “Simplot” big and red on the side. I used to see Simplot cars from my office window, but we’ve relocated so I don’t get to look at the trains as much. Fortunately you can see one here. 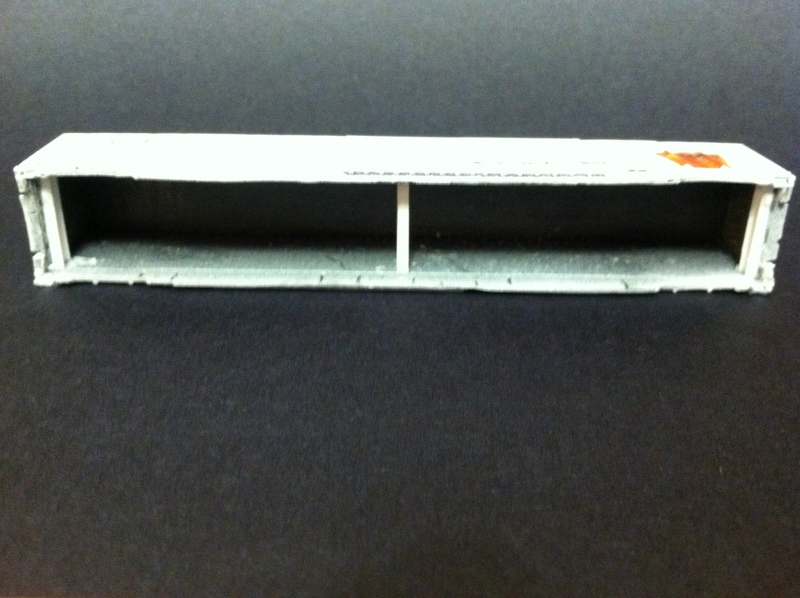 Styrene strips stabilize and level the carbodies. 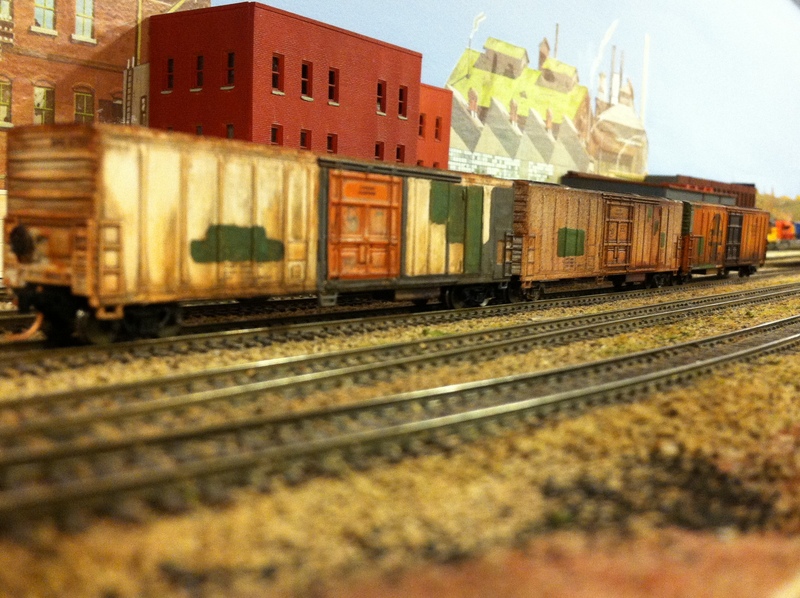 A friend from the railroad club gave me a pair of 65-foot boxcar kits that rival the gigantic Simplot variety. They were old Roundhouse kits, I think. The molding was a little sloppy, so I did a lot of filing and trimming. There were also a couple spots where bubbles left voids in the casting. I filled these with Squadron White Putty. The underframes fit poorly, so I installed some strips of styrene at the base of the carbodies to make them ride level and fit securely. The kits came with stirrup steps of the MicroTrains variety that snap into a goove in the underframe. However, the underframes lacked the appropriate machining to accomodate these. I cut off the steps and glued them to the carbodies directly. They’re good enough, though not perfect. Finally, the models were molded with a wheel mechanism for securing the doors, but did not come with matching wheels. I remedied that with a set of HO-scale brakewheels that look about perfect. HO-scale brakewheels are a fine replacement for the missing door-securing wheels. Once I had the carbodies to my liking, I cleaned them thoroughly, then sprayed them reefer white. I set them aside to dry for several days. The “Grandpa Ray’s” herald and the other markings were made with Word, including “NEW 10-2013” marks to set the cars, and the layout, in the present day. The bushel of apples is clip art. I made several duplicates of each decal, expecting to ruin some in the application. I printed the decals using my inkjet printer and let them dry for 24 hours before spraying them with Testor’s decal bonder. I let that dry for another 48 hours. I applied my homemade decals like I do any others: I soak them in room-temperature water, and while they soak I brush a layer of MicroScale MicroSol Decal Setting Solution onto the model where the decal will go. I then apply the decal, and put another layer of MicroSol over the top. MicroSol can make larger decals wrinkle up. They almost always dry beautifully flat, conforming to the finest molded details. 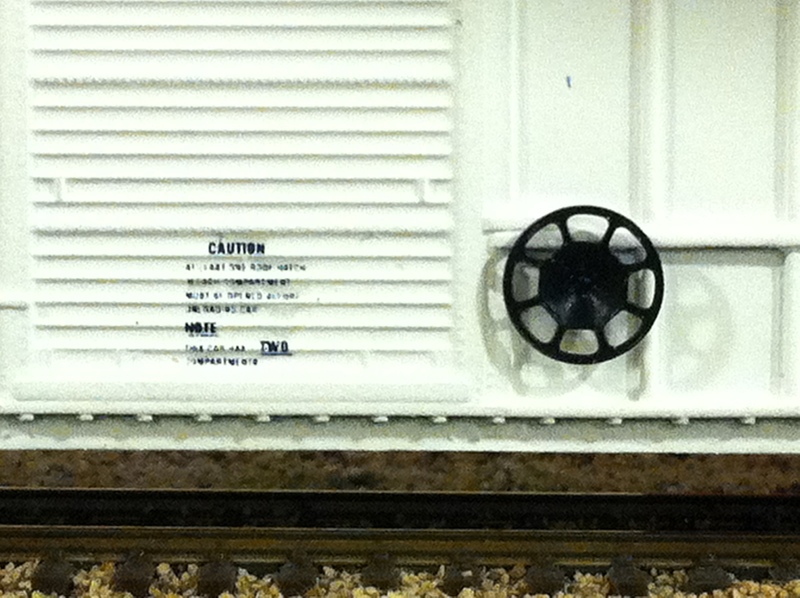 Warning and instruction markings culled from storebought decal sheets rounded out the lettering. The kits did not come with trucks, so I installed MicroTrains 100-ton roller bearing trucks with medium extension couplers. I added Fox Valley Models 36-inch metal wheelsets, which I painted rail brown. These models represent brand new rolling stock, so I did not weather the carbodies or the trucks. I carefully painted the bearing caps light blue to appear factory-fresh. Unweathered MicroTrains trucks with the bearing caps painted blue give the models a factory-fresh feel. The bushel of apples is a clip-art image printed on clear decal paper. I have four other mechanical refrigerator cars that will join the Grandpa Ray’s fleet, carrying RAYX reporting marks and numbered 310 – (1 through 6). One of these wears reefer white and the decaling shown above. The others are patch-outs – Grandpa Ray would rather they get to work than hang around getting dressed up. A trio of second-hand mechanical reefers will simply be stenciled with RAYX reporting marks. Grandpa Ray would rather they get to work than hang around getting dressed up.